When many people think of nature, they think of the big things—birds of prey, big predators, soaring mountains, vast deserts, and deep oceans. But, here, I want to talk about appreciating the things that are much closer to us, especially to children who are literally closer to the ground than we are as adults. Though there are many excellent technological tools that are becoming a part of nature experiences, the wonders that can be discovered by giving a child an old fashioned magnifying glass in the woods are amazing. In fact, there are many simple ways to encourage your child's observation of nature's micro-world. Below are a few of my favorites. As Cornell points out, nature is always working. There is always something to see. Most of it we pass over each day because it is so difficult to notice. Children are amazed and consumed by the smaller aspects of nature. They see things that we pass right over. In part, they are lower to the ground than we are. Children have a different perspective. Hand your child a magnifying glass, show them how to use it, point out one or two places to start and then sit back and be amazed at what they will find, what they will want to show you, and what they will learn about the micro-world around their feet. If you have older children, see if they can document what they have found in a notebook by drawing what they see. David George Haskell wrote an excellent book titled, The Forest Unseen: A Year’s Watch in Nature. Though this is really a more advanced scientific approach to observing nature, the principles can easily be applied children’s activities. In Haskell’s case, he mapped out a “one-square-meter patch of old-growth Tennessee forest” that he visited and took notes on almost daily. Haskell focused on the tiny, micro workings of the forest and connected these findings with the larger world of nature. 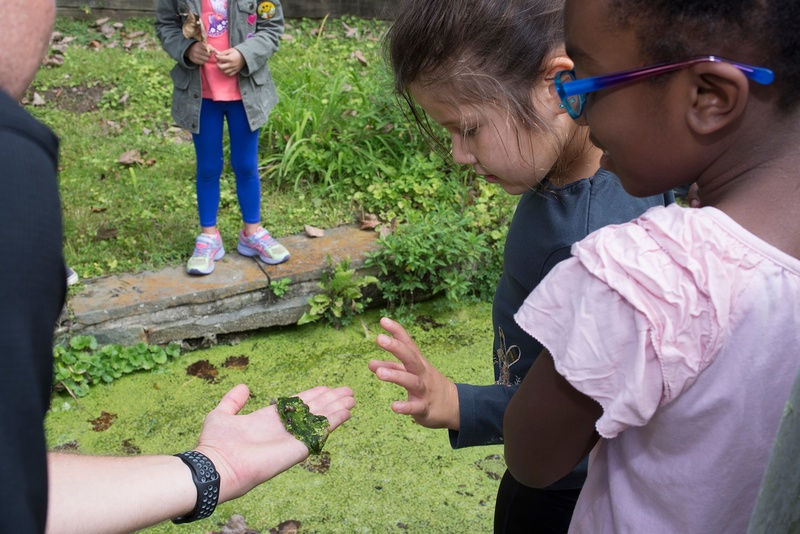 Though Haskell’s observations are deeply rooted in ecological and biological science, interested children can notice almost as much as any fully trained adult. Do you have a little patch of woods behind your house? Take some twine and a few stakes and map out your own one-square-foot station for your child to observe once a day, once a week, or whenever the seasons are starting to change. They’ll be excited when something new pops up and they will make direct connections to the seasons and the workings of nature surrounding their spot. Here is a great link to a lesson plan developed by Outdoor Classroom Today that goes over this great activity in more detail. Once children get over the hump of, “Eww...a bug!” they start to become fascinated with colors, sizes, movements, and diversity of insects. If your child is an “Eww, bugs!” type, start slow with gentle, more attractive bugs. Butterflies are a great starting point. Print out a few pictures of different types and see if you can go out and find some. September is a great time of year for butterfly hunting. Stick to the flowers and well gardened areas. For example, if you’re out near the national mall, there are butterfly gardens on nearly every edge of Smithsonian buildings. Stop into the Museum of Natural History’s Butterflies and Plants exhibit to take the excitement to the next level. If your child is more the, “Cool! Bugs!” type, cut them loose in a patch of garden or wooded area with a few little containers and see how many different bugs they can find. The blog writers at Raising Little Shoots offer a great resource that they call Mini-Beast Week, and they list a few outside resources to help you get started on the world of entomology. Besides the good old fashioned magnifying glass, there are many new forms of technology that can be used to accentuate outdoor experiences. Citizen science is a new age way of gathering important data, and you and your child can join in the fun, simply by taking pictures of insects, flowers, plants, and wildlife. iNaturalist is one of the most influential organizations participating in this new science. By using a smart phone and the iNaturalist app, you and your child can take a picture, upload it to the app, share it with others and create a discussion based on your findings. Nature Passport is another great organization with a similar app. For older children, this is a great way to teach basic scientific principles, including the steps in the scientific process. First, children are participating in the process of gathering data. Second, the information is crowd-sourced and shared with other naturalists. Finally, results are analyzed through a discussion of fellow iNaturalist users, and connections are made on a nation-wide and sometimes global scale. Another great new app developed by those at iNaturalist is called Seek. This incredible app will analyze the micro world photos you take with a smartphone and can identify the species for you. See a beautiful flower but don’t know the name? Snap a photo while on a hike with your child to show them more. Gaming modes can encourage kids to get outside, and a badge-earning setting motivates some children. Photographing the tiny things you find outdoors can be a lot of fun. But, it can be a lot more fun if you have the right lens. In a post by iMore.com, writers explain which smartphone lenses work the best for certain conditions. I’ve had good results with Xenvo lenses in the past. So get out there and see what tiny things you can find. Use the world of technology to document what you discover. Record observations in notebooks. Take your child’s learning to the next level by visiting a museum. 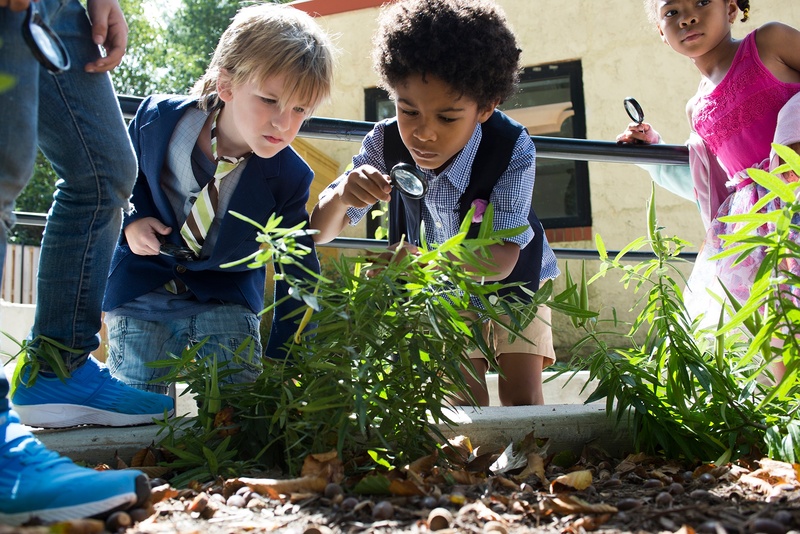 Spark your child’s interest in becoming the world’s next great entomologist. Or, just give them a magnifying glass and let them explore. Still interested? Here is a link to a blog post I wrote explaining one of my micro-hikes with the Voyagers’ Outdoor Program in New Jersey.